Allow me to introduce myself: Chris Matarazzo, writer, drummer, philosopher, father, thinker, mender of fences (really, I fixed my fence once) and archaeologist of the human spirit. I am a master of English (because it says so on a piece of paper) and a vice-principal in charge of academics (because it says so on my office door). 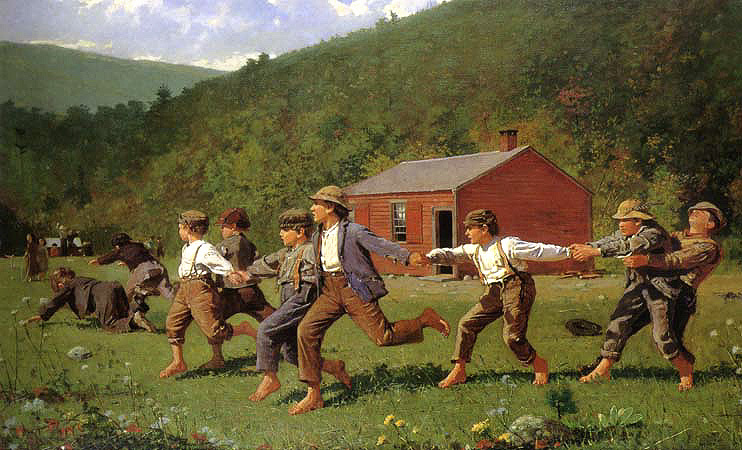 Winslow Homer: "Snap the Whip"
I pay bills, play classical guitar and I have conversations with educational donors and deans of stuff for various important reasons. I read books -- lots of books. I have scads of them on shelves around my living room and when people ask me why I don't just borrow them from the library to leave room on the walls, I shake my head sadly, painfully aware of the decline of humankind. I am grown, important chap who carries a briefcase and is forced to wear ties and uncomfortable, yet shiny, shoes. I compose songs and, sometimes, pieces of music for orchestras that -- let's face it -- will never be played. When I was a boy, I used to think I would become Billy Joel -- that oceans of people would cheer for my music and crash upon my stage in waves of love. When I was a boy, I thought for sure that the world would see something special in me and hold me up for everyone to see. Still, I seem to tread the ground in a crowd. Yes. I think and think and think and I complain when I have to work hard. I teach my children difficult lessons and I frown at the behaviour of some of my students. I walk the icy surface of Lake Responsibility, even as I hear the cracks running under the combined weight of my body and of my rebellious ideas. Yet, this afternoon, going to pick up an unhealthy dinner for my family, I drove down a tree-ceilinged road bathed in sunset light, and, coming toward me, on the pavement to my right, was an individual who, I realized, makes all of my accomplishments and dreams and arrogant self-satisfactions petty. He was superior and, so, joins the growing ranks of the many I find to be superior to me as I grow older. He was dressed as a banana. A big, yellow banana. And he whooshed by me on a shining aluminum scooter -- laughing as loudly as a little boy could laugh on a dwindling Sunday -- and his mother and father were sitting on their front step, laughing, too. Sometimes, someone sends down a message. In this case, it was dressed as a tropical fruit and flying under a sunset on wheels. Maybe, the more we grow, the less we are, after all.